After months of talks and several setbacks, the Afghan government recently reached a peace agreement with Gulbuddin Hekmatyar's Hezb-i-Islami (HIG). On September 29, Afghan President Ashraf Ghani signed the agreement at the presidential palace in Kabul during a ceremony broadcast live on television. 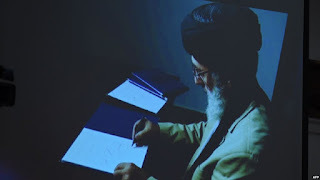 Warlord Hekmatyar, who is believed to be hiding out in Pakistan, addressed the gathering in Kabul in a recorded video message that showed him signing the peace deal in a small room at an undisclosed location. He called on the Taliban and other parties to join the peace process and urged the Afghan government to fulfill a number of demands not mentioned in the agreement, such as releasing key Taliban prisoners. “We will seriously consider any sanctions delisting request put forward by the government of Afghanistan," the U.S. official, who did not want to be identified, told Reuters. "If the security council deems the sanctions imposed on certain individuals to be outdated and no longer in the interest of Afghan peace and stability, then we will need to reconsider these measures." Hekmatyar, the largest recipient of U.S. military assistance during the Soviet-Afghan war in the 1980s, was designated a "global terrorist" by the U.S. government in February 2003 and blacklisted at Washington's request by the UN a few months later. His rehabilitation is being heavily criticized in Afghanistan and abroad. Human Rights Watch researcher Patricia Gossmann called Hekmatyar's return an affront to his victims and warned that this "will compound the culture of impunity that the Afghan government and its foreign donors have fostered." Criticism came also from the Taliban, albeit for other reasons. The group emphasized that Hekmatyar "committed a major crime" by signing a peace deal with the Kabul government, damping hopes for a similar agreement with the Taliban in the near future. Nevertheless, several countries welcomed the peace agreement, including the United States and Pakistan, the two nations that have played the biggest role in enabling Hekmatyar's rise to power and his decades-long warlord career. "Basically, this is a positive but mostly symbolic step because the Hezb-i-Islami party is not an important player as far as the military confrontation in Afghanistan is concerned. If this agreement really puts an end to the confrontation between this group and the Afghan government, then it is a positive point. But we must realize that the agreement is not going to influence the military and political balance of power in Afghanistan." Kabulov confirmed that Russia is going to participate in the upcoming Brussels Conference on Afghanistan, which is expected to pledge over $3 billion a year in development support for Afghanistan. As usual when it comes to benevolent donors, there is a catch. According to a leaked restricted memo, the European Union (EU) wants to make some of its aid "migration sensitive," thereby forcing the Afghan government to accept tens of thousands of refugees. Despite acknowledging the "deteriorating security situation with record levels of terrorist attacks and civilian casualties," the EU concludes that "more than 80,000 persons could potentially need to be returned in the near future." Caught between Taliban attacks and U.S. drone strikes, many Afghans are trying to flee the endless violence. Forcing refugees to return to the war-torn country and pouring more money into a corrupt system seems more like a recipe for disaster than a long-term solution. With the parliamentary elections in Georgia on October 8 rapidly approaching, tensions between the ruling Georgian Dream coalition and the United National Movement (UNM) of former President Mikheil Saakashvili are running high, once again. In the run-up to the elections, Georgia's Prosecutor General's Office brought new charges against four Saakashvili-era officials for their role in the bloody dispersal of anti-government protests in May 2011. Only one of them, former security chief Data Akhalaia, is not sitting in prison. Akhalaia left Georgia after the UNM lost power in 2012, thereby escaping prosecution to this day. In connection with the new charges against Akhalaia and other Saakashvili-era officials, the Georgian authorities also wanted to question former Deputy Interior Minister Giorgi Lortkipanidze, who followed his old boss to Ukraine and is now serving as Odessa's police chief. After Lortkipanidze refused to show up for questioning, the Tbilisi City Court sentenced him to pre-trial detention for exceeding official powers during the 2011 protests. As Ukraine has established itself as the preferred destination for Georgian criminals, an extradition seems highly unlikely, regardless of the charges and their merit. Lortkipanidze is perhaps best known for his involvement in a secret government training program for Chechen fighters, which received some attention after one of Lortkipanidze's former employees was named as the mastermind behind the June 2016 Atatürk Airport attack. Fortunately for Lortkipanidze, the current Georgian government is not willing to go down that road. Saakashvili and the United National Movement are confident that they will be able to end the reign of the governing Georgian Dream alliance on October 8, paving the way for the return of former Georgian officials who fled aborad. 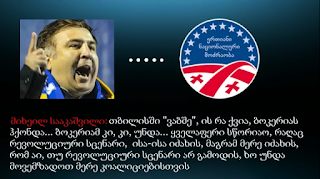 During a campaign rally in Zugdidi on September 26, Ukrainian citizen Saakashvili told his supporters via video link from Ukraine that the UNM's election victory is "absolutely inevitable" while his wife Sandra Roelofs claimed that Saakashvili will return to Georgia after the election "to celebrate victory together with us." Georgian Defense Minister Levan Izoria responded to Roelofs' comments by saying that the country's law enforcers would take "relevant steps" as soon as Saakashvili crosses the border. One day later, on September 27, Georgia's State Security Service announced that it has launched an investigation under Article 315/1 of the Criminal Code into a possible conspiracy to overthrow the government in connection with an audio recording (English transcript) that was uploaded on YouTube overnight. Petre Tsiskarishvili: "In reality, there will be popular uprising and f*ckin' helter-skelter. We’re still in the East. There will be f*ckin' Gaddafi. They must drag him out and f*ck him in the *ss with a stick." Saakashvili: "I’m glad we’re on the same page, and I think most people are, too. It’s just that we must punch their lights out openly, but the time is not ripe, and Rustavi 2 will make sure it is ripe." After the recording emerged, the UNM said it "strongly denies planning destabilization, plotting or having any scenario for revolution." Saakashvili and the implicated MPs dismissed the audio recording as a fabrication. Parliamentarian Petre Tsiskarishvili suggested that the State Security Service put together doctored recordings of various wiretapped conversations while his colleague Akaki Bobokhidze denied having held any phone conversation with Saakashvili this year. Last October, similar recordings of two phone conversations between Saakashvili, senior UNM leader Giga Bokeria and Rustavi 2 director Nika Gvaramia about a "revolutionary scenario" were leaked during the Rustavi 2 court battle. In this particular case, Bokeria and Gvaramia confirmed the authenticity of the recordings, whereas Saakashvili insisted that the calls had been intercepted and doctored by Russian intelligence. At the time, the State Security Service also launched a coup investigation under Article 315/1, the results of which have not been reported. All of this makes the latest leaked audio recording and coup investigation even more curious. U.S. Ambassador to Georgia Ian Kelly was quoted as saying that "the only way to come to power is through the ballot box; any other way is illegitimate." This would mark a major shift in U.S. policy and complicate Saakashvili's efforts to return to Georgia. Opinion polls indicate that neither Saakashvili's UNM nor the Georgian Dream alliance will be able to win a majority in the new parliament. The power struggle between both sides is set to continue and could become even more interesting after the October 8 elections. On September 21, Armenia celebrated the 25th anniversary of its independence with a major military parade in the central square of the nation's capital Yerevan. After Russian-made Iskander missiles were spotted during a rehearsal a few days earlier, neighboring Azerbaijan watched the Armenian military equipment even more carefully than usual. During the military parade on September 21, Armenia showcased two Iskander launchers and two reloading vehicles alongside other new equipment. 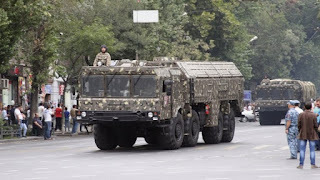 Given that Armenia's acquisition of Iskander missiles hasn't been announced officially, the display of the powerful short-range ballistic missile system prompted a lot of speculation in Armenia and abroad. Armenians speculated that the missiles were perhaps restricted for use only against Turkey - or that Russia's Iskander-M missiles in Armenia were being used in a joint Russian-Armenian PR stunt to placate the population. Shortly after the first pictures emerged, two "managers of the Russian military-industrial complex" confirmed the delivery of Iskander missiles to the Armenian military, making Armenia the first foreign state to have the missile system. One source suggested that the acquisition was intended to deter Azerbaijan from attacking Armenian population centers and from carrying out its threat to inflict "crushing blows" on Stepanakert, the capital of Nagorno-Karabakh. According to Sergey Minasyan, Deputy Director of the Caucasus Institute in Yerevan, the Iskander missiles have been in Armenia's arsenal for quite some time and for that reason Azerbaijan decided not to launch large-scale artillery attacks against strategic Armenian forces or population centers during the so-called Four-Day War earlier this year. Azerbaijan tried to play down the significance of Iskander missiles in Armenian hands. "Armenia did not obtain "Iskander M" missiles, which are able to bring down the target at a distance of 500 km, but "Iskander E" sighting range of which are 280 km. The service life of these ballistic missiles had already expired." Russia and Armenia were reportedly negotiating about the delivery of Iskander-M systems, but it is unclear which version Armenia eventually obtained. While claiming that Azerbaijan is not worried about Armenia's Iskander-E missiles, Jamalov announced that Baku is now trying to acquire the necessary technology for producing ballistic missiles with a range of 280 km. Many analysts suspect that Azerbaijan is working on a deal with Pakistan. According to some reports, Baku has been in talks with Islamabad to purchase Pakistan's Shaheen 1A (Hatf IV) missile system, which is comparable to the Iskander system. In the run-up to the ADEX 2016 in Baku, Azerbaijan's President Ilham Aliyev received a Pakistani delegation headed by Pakistan's Minister of Defense Production Rana Tanveer Hussain. The two sides agreed to expand their cooperation in the defense sector and discussed the production of ballistic missiles, among other things. As the arms race in the South Caucasus is heating up, Aliyev also found the time to consolidate his grip on power in Azerbaijan. On September 26, Azerbaijan held a referendum on 29 proposed amendments to the constitution. Aliyev found strong support for all amendments. 91.2 percent voted in favor of extending the presidential term from five to seven years. Neither allegations of fraud nor the fact that the vote-count total exceeded 100 percent seemed to bother Aliyev. He said the referendum showed "the great confidence that the people have placed in our policy." Azerbaijan's undisputed leader can now focus on solving the country's Iskander problem.